The global lithium-ion batteries market is consolidated with regards to competition, states Transparency Market Research (TMR). The top three market players, LG Chem Power Inc., Samsung SDI Co. Ltd., and Panasonic Corporation accounted for a whopping share of 57% of the global market for lithium-ion batteries in 2015. It is expected that the degree of competition will remain high during the forecast period, making entry difficult for new players. A number of market players have been partaking of the voluminous opportunities offered by the automotive sector worldwide. For instance, in April 2017, Suzuki Motor Corp. announced that it will establish a joint venture with Toshiba Corp. and Denso Corp. in order to produce lithium-ion batteries for electric vehicles in India. Several innovative products are also being developed. For example, in the same month, researchers at UC Riverside has come up with a low-cost solution which uses discarded glass bottles to create lithium-ion batteries. These batteries are capable of storing nearly four times more power than conventional batteries, lasting much longer. In 2015, the global market for lithium-ion batteries was pegged at US$29.68 bn. Registering a promising CAGR of 11.6% between 2016 and 2024, the global market for lithium-ion batteries is expected to attain a revenue worth US$77.42 bn. Geographically, the global market for lithium-ion batteries is presently dominated by Asia Pacific, driven by high demand from the consumer electronics and electric vehicles. The low power lithium-ion battery segment emerged as the leading segment in the global market for lithium-ion batteries in 2015, accounting for a share of 35% in the market. The 18-28 KWh segment has also been slated for significant growth. During the forecast period, this segment is expected to expand at an optimistic CAGR of 16.7%. By application, the global market for lithium-ion batteries was led by consumer electronics in terms of revenue. The growing preference for clean fuels across the automotive sector has been a primary growth driver of the market. As lithium-ion batteries are increasingly being used in smartphones, tablets, personal computers, power tools, and digital cameras, the demand for these batteries is likely to witness an upsurge. Offering an ideal alternative to nickel-based batteries, lithium-ion batteries are highly popular among several prominent automobile manufacturers. The increasing number of HEVs, EVs, and BEVs that have been deploying lithium-ion batteries has also been assisting the growth of the market. “The growing consciousness among automobile manufacturers and customers alike about the advantages offered by clean fuel, soaring fossil fuel prices, environmental concerns, and diminishing natural resources has been responsible for the growth of the market”, says the lead author of the report. The increasing penetration of smartphones and growing demand for consumer electronics on a global scale are fuelling the market for lithium-ion batteries. On the contrary, the relatively higher costs of these batteries when compared with traditional batteries might restrict growth. The safety issues associated with lithium-ion batteries and inadequate charging facilities can also inhibit the growth of the global market for lithium-ion batteries. However, the extensive opportunities offered by the emerging markets can ensure the further expansion of the market. 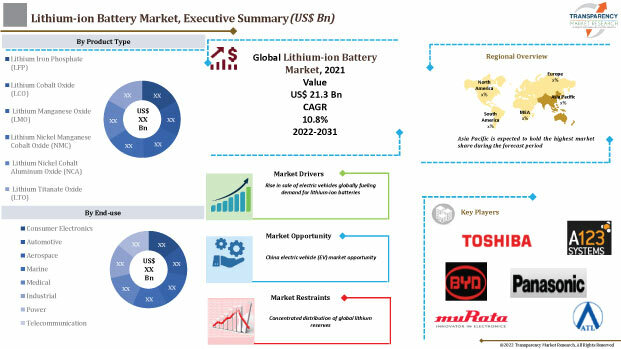 The information presented in this review is based on a Transparency Market Research report, titled, “Lithium-ion Battery Market (Power Capacity - 5-25 Wh, 48-95 Wh, 18-28 KWh, 100-250 KWh, More than 300 KWh; Application - Consumer Electronics, Automotive, Grid Energy & Industrial ) - Global Industry Analysis, Size, Share, Growth, Trends and Forecast 2016 - 2024”.